Grant kept the fire going even in the rain! Each morning Dad would get up early and take Courts out in a canoe and they would fish. I would get up, find a nice rock to sit on, read the Bible and thank the Lord for such a beautiful place. It seems like when there are no phones, TV’s, or radios, it’s easier to talk to God. It just seems like he can hear you better and I know I can hear him better with all the cares of life on hold. After that, I started pancakes while Grant built a fire. Like most young boys, Grant loved building fires. 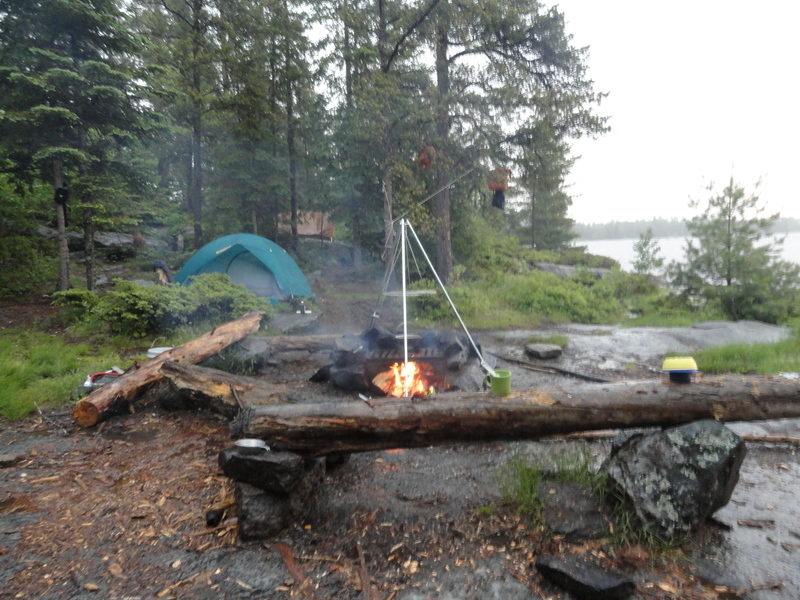 He hunted wood, chopped wood and kept the fire going even in the rain. It was sure handing having a boy like Grant doing such a good job finding wood to keep the fire going. Dad and Courts got back about 9:00 a.m. and we finished breakfast. It was an overcast day and the wind was blowing out of the west. Dad has always repeated that old wives tale that says, “Wind from the East, fish bite least. Wind from the West, fish bite best.” Well I never really thought much about it, but this trip to the BWCA has me believing. 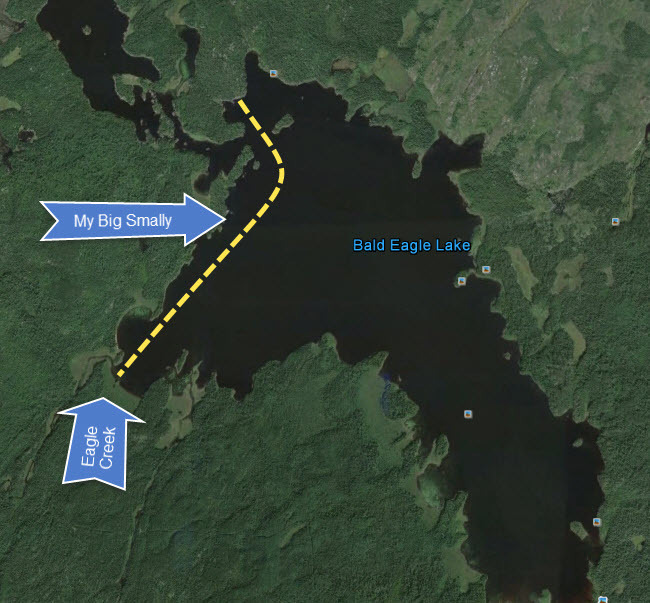 We paddled up across Bald Eagle Lake, which is the lake we were camped on, and then we turned to the east and fished up the north side of that big cove. We went right back by our first campsite on this route. We picked this location because Dad said that back when he brought Mom to the BWCA they fished that cove all the way back to Bald Eagle creek and that Mom caught more fish that day than ever before. Dad also added, “I caught my biggest northern ever at the end of this cove.” That had Grant, Courts and me all excited and ready to hit that cove! 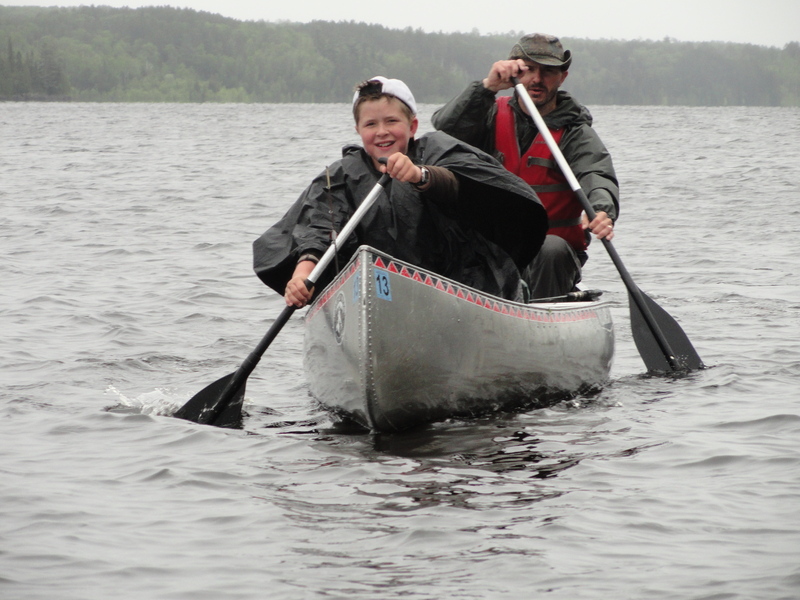 The great thing about fishing with Dad this year was he let me sit in the front of the canoe while he sat in the back. He likes to catch walleye, so he would let his line out and troll while he paddled. This allowed me to fish without having to paddle, unless he got hung. I was living the life of Riley up at the front!! We rounded the first outcropping and turned into the big cove and I started fishing. Dad had given me a hard time about bringing a big dip net I bought, because he said in all his trips he never brought a dip net. I’m an optimist so I packed it in anyway. The only problem with this net was the handle had a release button that had to be pushed to get it all the way out. I had it in the canoe but I had not released the handle yet. This would prove disastrous!! Another major concern was my lure. That morning when we were rigging our poles dad had me put on the red and white dare devil he caught his big northern with over 20 years ago. I told him I didn’t want to use that one, because if I got hung and lost it, I would never hear the end of how I lost his best lure. He insisted so reluctantly, I put it on while I said a prayer that God would not let me lose this lure. We fished about ½ mile along the shore as dad paddled, but had not caught anything. We came to a small inlet that had two big rocks sticking out with some water in the middle between them. It was the kind of spot I just knew a big fish was in. I was a little worried about the cast because occasionally I would over cast and hit the rocks and dad would rib me for scratching the paint off his best lure. I carefully flipped the pole and made a great cast with the dare devil landing perfectly between the rocks where my dream fish was waiting. Sure enough, WHAM, something hit that lure and the fight was on! I started reeling him in not knowing how big or what kind of fish he was. I could feel the front of the canoe pull to the right as he took a run out to open water. Courts and Grant were also to our right and they watched the whole episode. Just like the old days dad was coaching me and by this time I knew he was big. He was getting closer to the canoe and dad said, “Wow, he is big you better get the net.” As I was reaching behind me with one hand trying to grab the net he jumped out of the water and that’s when we could tell it was the biggest smally we had ever seen. The small mouth bass get big up there and they have a brilliant gold color to their bodies. Even though it was a cloudy day I can still remember the brilliant shine to his scales as he leaped out of the water on the final jump. I just sat there gazing at the water, but after a few seconds I quickly made another cast between the rocks… nothing happened. He was gone and I had missed my chance. Of course, they now started ribbing me about my net not being ready and how I had let the state record smally off the hook. I just kept quiet, kept casting and made sure the net was ready for the next one. I’ll have to finish this post later. There was a lot of action on day three and it will take more than one post to cover it all.